The study, published by the American Academy of Ophthalmology, focuses specifically on medical students studying ophthalmology–the medical field focused on the eyes–because so much of that discipline relies on doctors using observation to examine and diagnose patients. 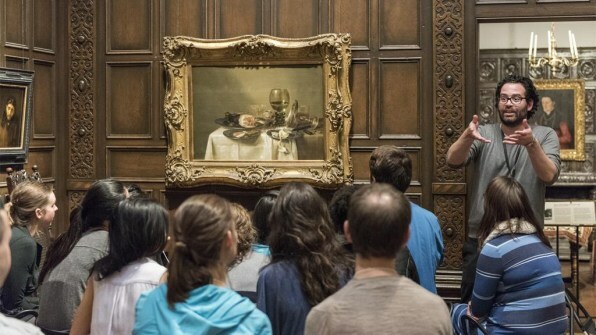 For the study, 18 first-year medical students took art observation classes, where they had six-hour-and-a-half sessions at the Philadelphia Museum of Art, while a control group also composed of 18 first-year medical students did not. None of the students had prior art training.The art observation classes included lessons on color, shape and lines, perspective, and using observations to support a claim or provide the jumping off point for a question. The students in both groups took observation tests before and after the art classes, where they were asked to describe art images, retinal photographs, and photographs of people’s faces that showed signs of different types of eye disease. They were then graded on the overall quality of their descriptions as well as whether they included particular medical observations.